Mañjuśrī is a bodhisattva associated with prajñā (insight) in Mahayana Buddhism. In Tibetan Buddhism, he is also a yidam. His name means "Gentle Glory"（Chinese：妙吉祥, 妙乐） in Sanskrit. Mañjuśrī is also known by the fuller name of Mañjuśrīkumārabhūta, literally "Mañjuśrī, Still a Youth" or, less literally, "Prince Mañjuśrī". Other deity name of Mañjuśrī is Manjughosha. Mañjuśrī Pala Dynasty, India, 9th century CE. Scholars have identified Mañjuśrī as the oldest and most significant bodhisattva in Mahāyāna literature. Mañjuśrī is first referred to in early Mahayana sutras such as the Prajnaparamita sutras and through this association, very early in the tradition he came to symbolize the embodiment of prajñā (transcendent wisdom). The Lotus Sutra assigns him a pure land called Vimala, which according to the Avatamsaka Sutra is located in the East. His pure land is predicted to be one of the two best pure lands in all of existence in all the past, present, and future. When he attains buddhahood his name will be Universal Sight. In the Lotus Sūtra, Mañjuśrī also leads the Nagaraja's daughter to enlightenment. He also figures in the Vimalakirti Sutra in a debate with Vimalakirti where he is presented as an Arhat who represents the wisdom of the Hinayana. Contemplate the five skandhas as originally empty and quiescent, non-arising, non-perishing, equal, without differentiation. Constantly thus practicing, day or night, whether sitting, walking, standing or lying down, finally one reaches an inconceivable state without any obstruction or form. This is the Samadhi of One Act (yixing sanmei, 一行三昧). Within Vajrayana Buddhism, Mañjuśrī is a meditational deity and considered a fully enlightened Buddha. In Shingon Buddhism, he is one of the Thirteen Buddhas to whom disciples devote themselves. He figures extensively in many esoteric texts such as the Mañjuśrī-mūla-kalpa and the Mañjuśrīnāmasamgīti. His consort in some traditions is Saraswati. The Mañjusrimulakalpa, which later came to classified under Kriyatantra, states that mantras taught in the Saiva, Garuda and Vaisnava tantras will be effective if applied by Buddhists since they were all taught originally by Manjushri. Mañjuśrī is depicted as a male bodhisattva wielding a flaming sword in his right hand, representing the realization of transcendent wisdom which cuts down ignorance and duality. The scripture supported by the padma (lotus) held in his left hand is a Prajñāpāramitā sūtra, representing his attainment of ultimate realization from the blossoming of wisdom. Mañjuśrī is often depicted as riding on a blue lion or sitting on the skin of a lion. This represents the use of wisdom to tame the mind, which is compared to riding or subduing a ferocious lion. 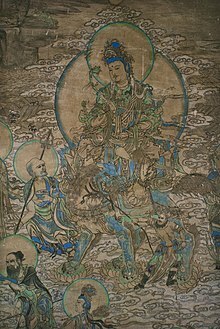 In Chinese and Japanese Buddhist art, Mañjuśrī's sword is sometimes replaced with a ruyi scepter, especially in representations of his Vimalakirti Sutra discussion with the layman Vimalakirti. According to Berthold Laufer, the first Chinese representation of a ruyi was in an 8th-century Mañjuśrī painting by Wu Daozi, showing it held in his right hand taking the place of the usual sword. In subsequent Chinese and Japanese paintings of Buddhas, a ruyi was occasionally represented as a Padma with a long stem curved like a ruyi. He is one of the Four Great Bodhisattvas of Chinese Buddhism, the other three being Kṣitigarbha, Avalokiteśvara, and Samantabhadra. In China, he is often paired with Samantabhadra. In Tibetan Buddhism, Mañjuśrī is sometimes depicted in a trinity with Avalokiteśvara and Vajrapāṇi. The Arapacana is a syllabary consisting of forty-two letters, and is named after the first five letters: a, ra, pa, ca, na. This syllabary was most widely used for the Gāndhārī language with the Kharoṣṭhī script but also appears in some Sanskrit texts. The syllabary features in Mahāyāna texts such as the longer Prajñāpāramitā texts, the Gaṇḍavyūha Sūtra, the Lalitavistara Sūtra, the Avataṃsaka Sūtra, the Dharmaguptaka Vinaya, and the Mūlasarvāstivāda Vinaya. In some of these texts, the Arapacana syllabary serves as a mnemonic for important Mahāyāna concepts. Due to its association with him, Arapacana may even serve as an alternate name for Mañjuśrī. Tibetan pronunciation is slightly different and so the Tibetan characters read: oṃ a ra pa tsa na dhīḥ (Tibetan: ༀ་ཨ་ར་པ་ཙ་ན་དྷཱི༔, Wylie: om a ra pa tsa na d+hIH). In Tibetan tradition, this mantra is believed to enhance wisdom and improve one's skills in debating, memory, writing, and other literary abilities. "Dhīḥ" is the seed syllable of the mantra and is chanted with greater emphasis and also repeated a number of times as a decrescendo. Mañjuśrī is known in China as Wenshu (Chinese: 文殊; pinyin: Wénshū). Mount Wutai in Shanxi, one of the four Sacred Mountains of China, is considered by Chinese Buddhists to be his bodhimaṇḍa. He was said to bestow spectacular visionary experiences to those on selected mountain peaks and caves there. In Mount Wutai's Foguang Temple, the Manjusri Hall to the right of its main hall was recognized to have been built in 1137 during the Jin dynasty. The hall was thoroughly studied, mapped and first photographed by early twentieth-century Chinese architects Liang Sicheng and Lin Huiyin. These made it a popular place of pilgrimage, but patriarchs including Linji Yixuan and Yunmen Wenyan declared the mountain off limits. 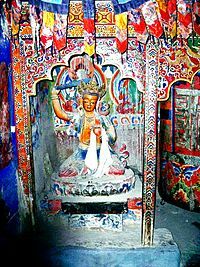 Apparently the association of Mañjuśrī with Wutai (Wu-t'ai) Shan in north China was known in classical times in India itself, identified by Chinese scholars with the mountain in the 'north-east' (when seen from India or Central Asia) referred to as the abode of Mañjuśrī in the Avataṃsaka Sūtra. There are said to have been pilgrimages from India and other Asian countries to Wutai Shan by the seventh century. According to official histories from the Qing dynasty, Nurhaci, a military leader of the Jurchens of Northeast China and founder of what became the Qing dynasty, named his tribe after Mañjuśrī as the Manchus. The true origin of the name Manchu is disputed. Should I laugh or not? In Tibetan Buddhism, Mañjuśrī manifests in a number of different Tantric forms. Yamāntaka (meaning 'terminator of Yama i.e. Death') is the wrathful manifestation of Mañjuśrī, popular within the Gelug school of Tibetan Buddhism. Other variations upon his traditional form as Mañjuśrī include Namasangiti, Arapacana Manjushri, etc. According to Swayambhu Purana, the Kathmandu Valley was once a lake. It is believed that Mañjuśrī came on a pilgrimage from his earthly abode-Wutaishan(five-peaked mountain) in China. He saw a lotus flower in the center of the lake, which emitted brilliant radiance. He cut a gorge at Chovar with his flaming sword to allow the lake to drain. The place where the lotus flower settled became the great Swayambhunath Stupa and the valley thus became habitable. In eighth century Java during the Medang Kingdom, Mañjuśrī was a prominent deity revered by the Sailendra dynasty, patrons of Mahayana Buddhism. The Kelurak inscription (782) and Manjusrigrha inscription (792) mentioned about the construction of a grand Prasada named Vajrāsana Mañjuśrīgṛha (Vajra House of Mañjuśrī) identified today as Sewu temple, located just 800 meters north of the Prambanan. Sewu is the second largest Buddhist temple in Central Java after Borobudur. 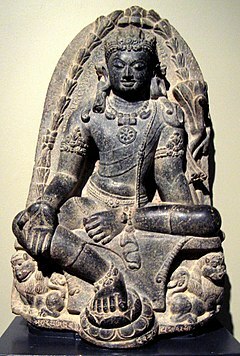 The depiction of Mañjuśrī in Sailendra art is similar to those of the Pala Empire style of Nalanda, Bihar. Mañjuśrī was portrayed as a youthful handsome man with the palm of his hands tattooed with the image of a flower. His right hand is facing down with an open palm while his left-hand holds an utpala (blue lotus). He also uses the necklace made of tiger canine teeth. ^ Lopez Jr., Donald S. (2001). The Story of Buddhism: A Concise Guide to its History and Teachings. New York, USA: HarperSanFrancisco. ISBN 0-06-069976-0 (cloth) P.260. ^ a b c Keown, Damien (editor) with Hodge, Stephen; Jones, Charles; Tinti, Paola (2003). A Dictionary of Buddhism. Oxford, UK: Oxford University Press. ISBN 0-19-860560-9 p.172. ^ Sanderson, Alexis. "The Śaiva Age: The Rise and Dominance of Śaivism during the Early Medieval Period." In: Genesis and Development of Tantrism, edited by Shingo Einoo. Tokyo: Institute of Oriental Culture, University of Tokyo, 2009. Institute of Oriental Culture Special Series, 23, pp. 129-131. ^ Davidson, J. LeRoy, "The Origin and Early Use of the Ju-i", Artibus Asiae 1950,13.4, 240. ^ Laufer, Berthold, Jade, a Study in Chinese Archaeology and Religion, Field Museum of Natural History, 1912, 339. ^ Liang, Ssucheng. A Pictorial History of Chinese Architecture. Ed. Wilma Fairbank. Cambridge, Michigan: The MIT Press, 1984. ^ *See Robert M. Gimello, "Chang Shang-ying on Wu-t'ai Shan", in Pilgrims and Sacred Sites in China:, ed. Susan Naquin and Chün-fang Yü (Berkeley: University of California Press, 1992), pp. 89–149; and Steven Heine, "Visions, Divisions, Revisions: The Encounter Between Iconoclasm and Supernaturalism in Kōan Cases about Mount Wu-t'ai", in The Kōan, pp. 137–167. ^ Heine, Steven (2002). Opening a Mountain: Koans of the Zen Masters. USA: Oxford University Press. ISBN 0-19-513586-5. ^ Agui (1988). 满洲源流考 (the Origin of Manchus). Liaoning Nationality Publishing House. ISBN 9787805270609. ^ Yan, Chongnian (2008). 明亡清兴六十年 (彩图珍藏版). Zhonghua Book Company. ISBN 9787101059472. ^ "诗僧寒山与拾得:文殊菩萨普贤菩萨化身" (in Chinese). Beijing: NetEase Buddhism Channel. 2014-12-10. ^ 韩廷杰. "寒山诗赏析" (in Chinese). Zhejiang: 灵山海会期刊社. Page dedicated to the Manjusri mantra, with several audio versions.